Angela Merkel might not have been too happy about having her calls listened in to, but to many of us working in the call centre industry having our conversations listened in to, recorded and then fed back to us is an everyday occurrence. 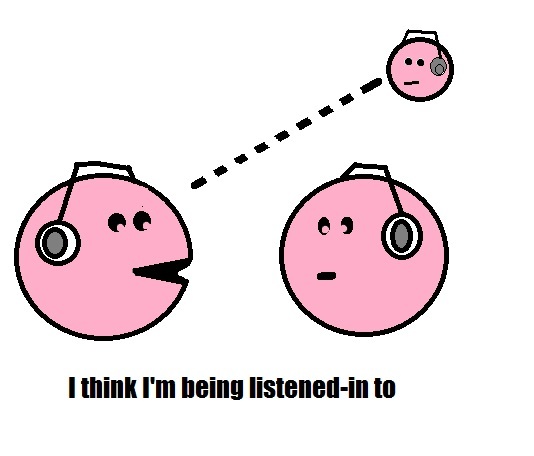 For me, being listened in to is never a nice experience. First there is the paranoia. Spotting a team-leader sat at a station you start wondering how long since you was last monitored, then they glance over. Momentarily you catch each others eyes before you both turn away. Convinced it’s you and begin upping your workrate until you’re throat becomes sore with the exertion. You push, prod and cajole customers into buying more, upgrading or whatever it is the company wants you to do – what on paper you should do – but which under normal circumstances you wouldn’t care less about hassling people for. Worst of all you have to do everything by the book. No cutting corners the way you do to keep your average call time down, and absolutely no writing off of trifling amounts to neatly circumvent an argument with a customer. Fortunately I’ve always been quite good at reading the signs and know when I’m being listened-in to and so can take full advantage of the Hawthorne effect which states that subjects being observed act differently due to the very nature of observation. Once however, I wasn’t so lucky. In my defence it was a very, very quiet day, with nothing much happening in the way of calls. I’d decided to put my feet up and take it easy. My big mistake though was calling up a colleague for a quick chat. Unbeknownst to me they’d just had a run in with their manager and unleashed an anti-management tirade which would have landed us both in hot water were they not already working their notice. As it was it was just me fighting to keep my job. Lesson learnt. Over the years, I have often found that it is possible to gauge a call centre’s efficiency by its attitude to listening to calls. A bad call centre usually has no facilities for listening to calls. In a well-run call centre, senior management will listen to calls on a regular basis and provide immediate feedback to agents. I’ll never love monitoring, and will always continue in the belief that monitoring is another part of the power imbalance in the Call Centre, but this something I’d agree with. In my worst call centre job I was monitored only once in two years. The reason for this quite simply is that for management monitoring calls is a time-consuming hassle they’d prefer not to do, particularly in the kind of call centre where everyone is over-burdened to the maximum. To listen in to half an hour of calls takes half an hour of a managers time, in addition to the time taken to feed-back which is likely to be at least another half hour and even then they’d probably only hear a very narrow range of scenarios – not enough to really gauge performance. Faced with a call centre of even twenty agents regular monitoring becomes a huge task. The problem which then occurs is that managers will always be desperate for some way of measuring the performance of their staff and without monitoring they then turn to the dreaded call stats. Quitting a job can put you in a remarkable position of power a power comes from the truth. The fear of the ultimate sanction, being fired, redundant there are no impediments to speaking honestly so like Pac-man swallowing the pill for a brief window of time the tables are turned with the ghosts on the run. If done well it can be an embarrassment for your employer as it was in the case of Journalist Richard Peppiatt’s witty destruction of the Daily Star and his boss Richard Desmond, or even better wiping off a reported figure of between $1 and $2 billion off your erstwhile employers stock value (not to mention any lingering damage to their brand) a la Greg Smith at Goldman Sachs. I had long had a plan for my resignation. It was to be similarly spectacular. At the end of my shift I’d cheerfully hand my manager, Peggy a sealed envelope inside which would be my notice letter delivering a savage and withering critique of her tenure as chief bully and incompetent. I would then produce numerous copies of the letter from my bag which I’d hand out to everyone present. Of course I’d be escorted from the building, probably by the towering figure of Big-Al himself, but I’d have gone down in a blaze of glory and enter the annals of call-centre legend. I am writing to advise you that I have been successful in gaining employment with (someone else) and will therefore like to offer my resignation. Unfortunately due to circumstances beyond my control I have only just received final confirmation of a start date, Monday the 14th November, from my new employer and due to the nature of training for my new role I have been told there is very little room for flexibility. I will therefore like to request that the requirement for a notice period is waived on this occasion. I appreciate that this is far from ideal and offer my apologies for this situation. I would like to extend my thanks to all at the call centre for their support over the past two years and I also appreciate that though our relationship has at times been difficult you have taken steps to improve this. I would also like to take this opportunity to wish the business and everyone involved all the very best for the future. For all my grand plans I was just happy to be making my way quietly to the exit. In my defence I did intend my letter to be cold and businesslike whilst being magnanimous and patronizing. However, this subtlety may well have been lost on Peggy. Yo may have noticed I haven’t written much recently. There are a few reasons for this, but the main one is that I just haven’t been in the call centre. Following the ruckus with my manager I was signed off with stress for a month. I have had no contact from anyone in management so have no idea what will happen when I open the door and tentatively set foot onto the call-centre floor. Will be leaped upon and dragged into the office where I’ll be issued with the paperwork for a disciplinary? Will I still have my desk? Can I remember all my passwords? I don’t know. What I do know is I’m dreading it. The vacant office cubicle opposite the canteen is becoming horribly familiar to me. I was called in again by my manager today. I had no idea what trumped up charge it would be this time. Adrenaline charged through my body like a bull maurauding through a Pampalonian alleyway. “You logged in at 9.36” she said. My start time is 9.30. We are made to get in early to be ready to take calls at our start time. For all the systems we have to log into now this means 10 minutes at least, though you can cut the time down by logging into the most used clients systems first and putting the customer on hold if its for another client.. “sorry the systems down” covers up a whole host of sins. Anyway this morning I know I hit my log-in button at 9.30 on the button. I was outraged. My manager said it was all down in black and white she had the print-outs to prove her point. I’d logged in at 9.36 there was no arguing. It all ended up in the HR managers office. The end result is that I’m going to have my log-ins observed on five occasions. If the system is at fault that’s the end of it, if the system is proved reliable then I’m on a disciplinary. Today, thankfully, I’m not in the call-centre. Recently it has become far more stressful than usual. I have come to the conclusion that my manager is actually bullying me. To say it seems bad, humiliating even. I wonder how could I allow this to happen to me? Earlier this week I was dragged into an office for ‘a word”. When I stepped inside there was an array of printed sheets laid out on a desk. One was an email from a customer complaining that they felt I was ‘too laid back’ and had not been helpful, another was an enquiry form I had completed which was annotated with ‘operator seemed defensive’ and finally there was a list of my log in times with one marked out in garish pink highlighter. I’m not claiming to be the best CSA in the world, or even the office for that matter, but I’m certainly not the worst. Unlike some of my other colleagues I rarely get into any confrontation with customers even the difficult ones. Just to cast some light though the first issue concerned me not being able to provide the customer with an offer code for a web based promotion as it had not been made available to me. Apparently I had also failed to apologise for the problems they had encountered on the web site which I can’t comment on as I can’t remember at all though I’m sure I would have done all I could to help. The second issue concerned a customer who I’d noted on the same enquiry form was ‘agitated’ the reason being that there order was not on the system and someone the day before I spoke to them had apparently promised them a call-back that day. The customer became aggressive towards me and I simply told them that I was trying to help them. This led to them mentioning that I had been ‘defensive’ to the manager who at my request had called back. Maybe some things could have been handled better I offered, but that’s part and parcel of the industry not every customer will be happy. My manager retorted that she felt every customer should feel I had done all I could for them. I suggested we listen to the calls and then discuss, but was told that no recordings of the calls existed… so my manager had decided I was at fault based purely upon the customers accounts. After the meeting I also recalled her dealing with a complaint about another member of staff, though she had been stood nearby for part of the call she had not heard the whole call and simply told the customer when they indicated they wished to make a complaint that she felt my colleague had handled the call appropriately. No further action was taken. You may feel there is an element of me being defensive here, maybe so as no one likes criticism, but complaints are an occupational hazard in customer service and I’ve never been dragged into a room in all my years in the industry. Right now I feel that I just don’t have any support and am vulnerable to the next angry customer who by chance gets put through to me. I just get the feeling that I am being singled for different treatment. Likewise with the log-on times. Many people, by their own admission, are not ready to take calls at their start time yet no-one else has been spoken to about this only me. The day after my talking to a colleague told me they had overslept, texted the manager on their personal number, was told ‘it’s ok” and then “fell back asleep”. They eventually came in half an hour late and were casually making their pre-log on cup of tea whilst telling me the story. Again no further action. As discussed on numerous occasions our priority is to take calls. I cannot stress enough the importance of staying seated and taking calls for the duration of your shifts. Every time some one leaves their desk we lose a call, whether it’s for a query, loo break or to get water. This, over a week can equate to in excess of 2000 calls lost, with a loss of revenue which we cannot afford in this difficult economic climate. Therefore moving forward I would like the following adhered to with immediate effect. All queries to be placed in the tray. (No visiting client managers to discuss) Even discussing with a colleague will mean 2 people off the phone, which is more calls lost. Queries will be dealt with from now on in, at specific allocated times to ensure minimum disruption. No outgoing calls to be made also. Checking the diary for holidays/ days off etc to be discussed and checked prior to start times or within your break/finish times. Or place a request in the tray and I will discuss with you when the phones are quieter. Mobile phones need to be away in the desk and switched off to avoid the temptation of reading, also no web browsing. Focus needs to be given during each and every call. Whilst I appreciate you may find this petty, this really is an ongoing issue that needs to be addressed, so I am looking for 100% cooperation form each and every one of you. The screen behind me is a clear indication of the volume of calls lost or waiting, please look at this so you become aware of how busy we are and the importance of taking as many calls as possible. Any questions or concerns please let me know, Thank you. I haven’t been in the call centre this week. Normally that would mean I’m happier and more relaxed, but things haven’t worked out that way this time. Instead the call-centre has been ominously hovering above me like that space ship in District 9. The reason is because things have got so bad. The latest thing is the new seating plan our manager has come up with which leaves me, for the majority of my shifts, sat on my own in a hinterland of unoccupied seating like a soviet era dissident sent to Siberia. Our great leader has also prohibited us from using wrap-up as apparently we should be dealing with system issues like leaving notes, processing refunds etc whilst on the phone…. and that’s at the same time as dealing with stacks written correspondence too. It really defies all logic. When I’m on a call I find out what the customer wants, or what the issue at hand is, then agree and confirm a course of action. This done I end the call there and do anything I then have to do on the various systems we use. It is impossible for me to do this system admin ‘whilst on the phone’ as I finish the call as soon as possible in order to as my employer insists keeping call times as low as possible. I have no need to keep the customer on the phone so what do I do ask them to hang on whilst I type and click through system menus? Ok, but then my call time goes up. Sadly this is typical of my manager who doesn’t actually do the job and just watches a live stats feed day in day out. I feel she is out of her depth and taking it out on some of us making our jobs and our lives harder. My stress levels have been continually rising as what was a bad job becomes an unbearable job. Even typing this is stressing me out so I know that I have to make a huge effort to leave. Anyway, better get back to job hunting. Why science says working in a call-centre is bad for your health.